The ocean breeze is the coolest it has been for the past few evenings, but still hospitable. In an effort to dodge tourist traffic I've decided to cut short on the legendary sunset in Oia and head back to my humble abode at Perissa Beach, about an hour away on the other end of the island that is Santorini. The mix of oversized Powerwheel toys that they rent to tourists, combined with the glut of car and bus traffic at sunset time, makes driving on Santorini sketchy at best, so while the masses are enjoying the sunset — all huddled together on the cliffs above the Aegean Sea while rustic Mediterranean music plays in the background and the clinking of plates and glassware dominate the auditory landscape — I'm making my best attempt to hit 80km/h on my little moped that could, aka "The Typhoon," which incidentally sounds more like a pack of geriatric bumblebees than a powerful windstorm as I buzz my way back along the twisty highway toward Fira (Thira in tourist speak), and eventually Perissa, the beach town where I'm staying. As a single, barely 30 something, Santorini is a difficult conundrum. It's September, and I've missed the high season, which has left the island in a very relaxed and somewhat empty state, also as it happens leaving me with little other company than 19 year old Aussie backpackers, and couples of all ages looking to reinvigorate or kick off their love life. 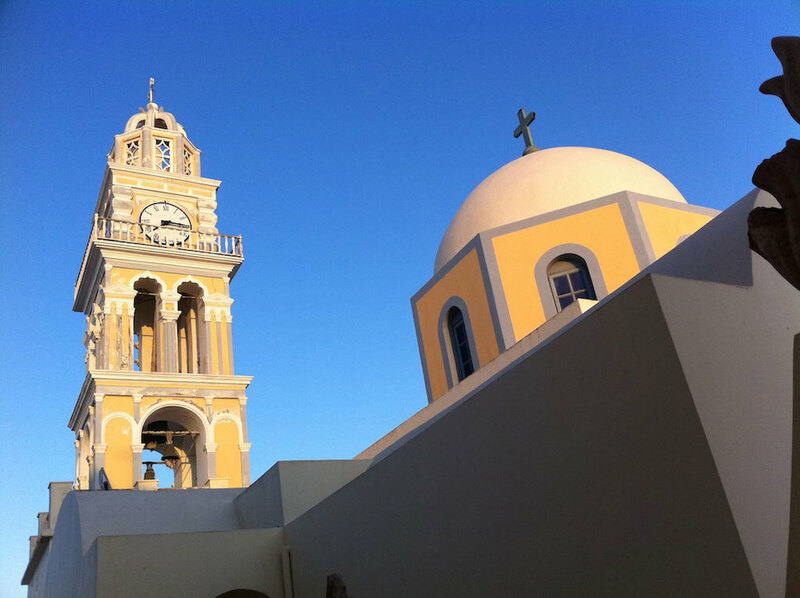 While Santorini always seems adequately tourist ridden in the main towns of Fira and Oia, my end of the island has calmed considerably. Whatever singles nightlife was here has evaporated like the Greek economy after a long hot summer season. Thankfully the moped has been the perfect solution to this. Riding these winding roads for the past few days has helped me fill the time as my restless mind does not take well to entire days spent on the beaches — which are amazing here by the way. 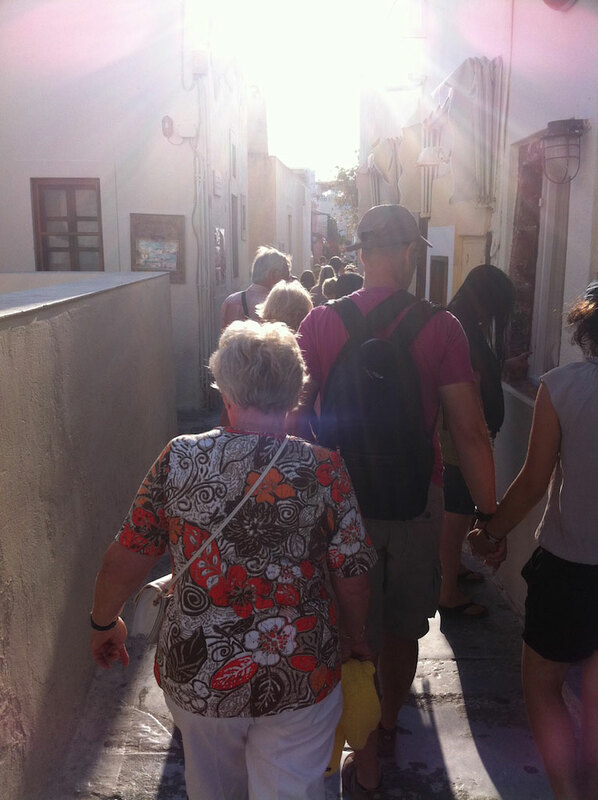 I arrived on Santorini several days earlier with a new travel friend I had met in Athens. She was determined to disconnect from her normal life back in Switzerland and had temporarily, and somewhat stupidly, divorced the internet in exchange for a good old fashioned guidebook. In these days of easy online booking, I decided to go along with the plan of old fashioned ad hoc travel. Together we had taken a cab to Piraeus Port in Athens in the wee hours of the morning to buy tickets for our departure, electing to save a few hours and spend about 20 extra Euros for the high speed ferry to Santorini. This proved to be wise, as the previous night's drinking events in Athens, combined with the choppy Aegean Sea were somewhat difficult to stomach. 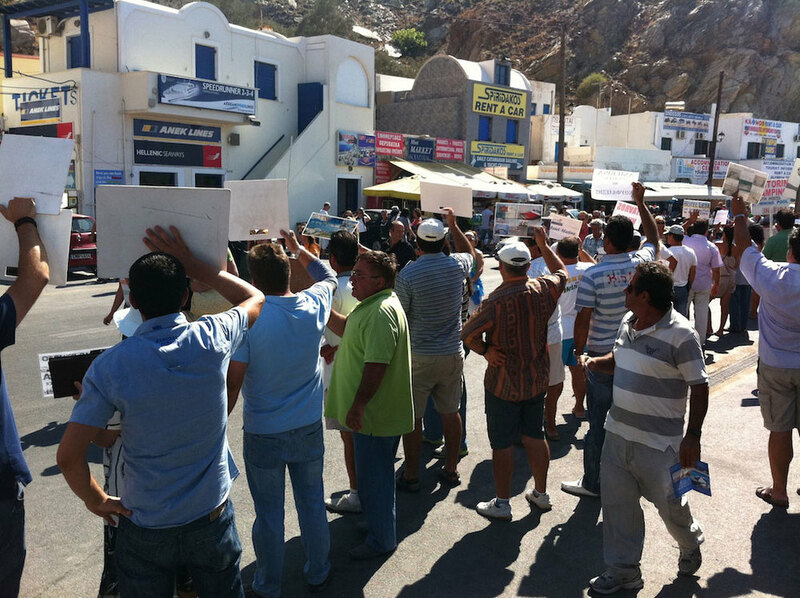 After remaining basically fetal and motionless for almost 5 hours we disembarked the ferry into a sea of only somewhat organized chaos on the island of Santorini. 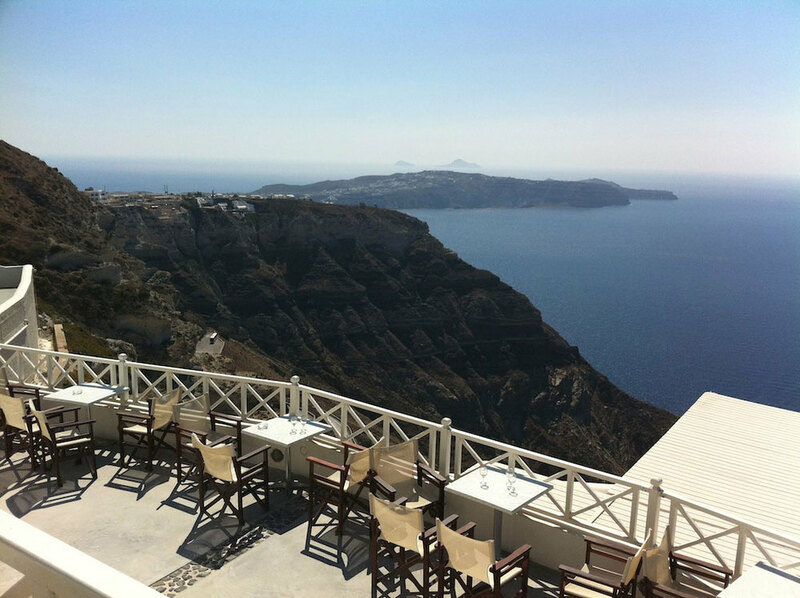 As I learned the hard way, Santorini is not the place to show up and wing it. 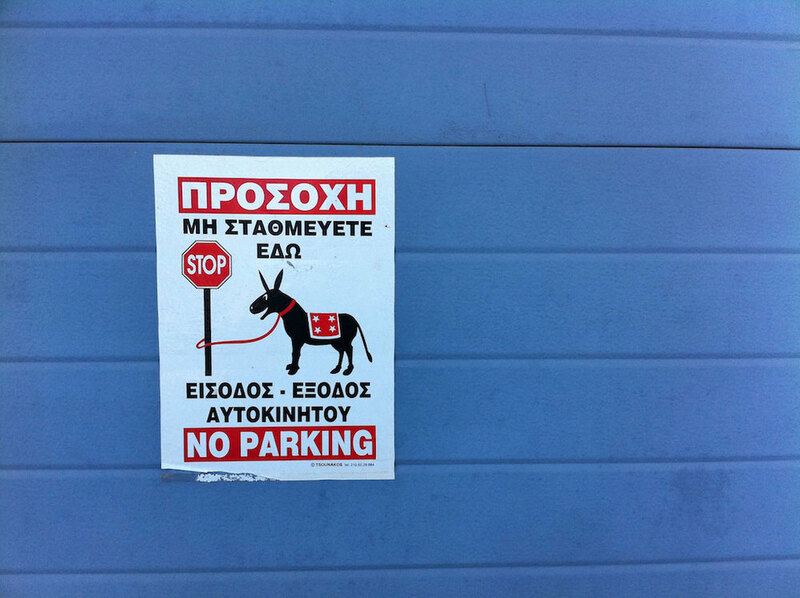 The public transportation is limited at best, and the port at Athinios is really not close to anything of note — particularly any accommodation. 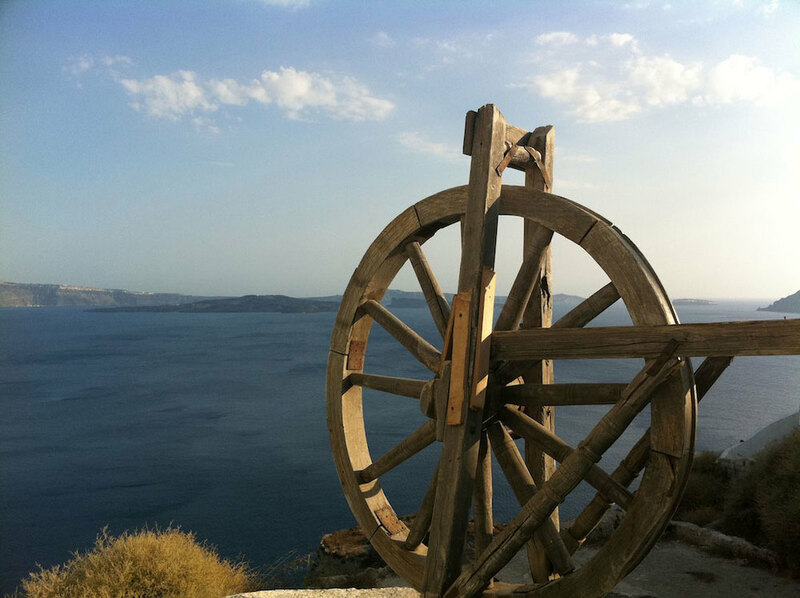 Prior to my arrival I had visions of being carted up the spectacular cliffside by donkey under the guidance of a friendly old Greek man, much like in The Sisterhood of the Travelling Pants, but what actually happened when I arrived couldn't be further from that. Imagine throngs, and by throngs I mean hundreds, of people get off the ferry to be met by a bustling but orderly mess of taxis, tour buses, and old hairy guys waving signs with hotel names on them. There is one public bus, but it fills up quickly, and only takes you into the town of Fira where you are left to fend for yourself. Cabs are also there, but the fare is almost as steep as the winding hill out of the port. As we disembark into this madness it becomes obvious that none of the signs being held up are for us since we had not booked anything. My travel partner (fast becoming nemesis) and I then spend too much time floundering indecisively trying to figure out what is going on, and miss all of the buses and taxis. Basically we are S.O.L. Normally I would be one to take charge, but when my temporary travel companion turns out to be a type A control freak with stress coping mechanisms that range from panic to chain smoking, I become a bit removed. Not wanting to cause a scene, I realize I need some alone time, and head to the internet cafe to look for an appropriate place to stay — leaving her to ponder her technology-free organic travel experience. A series of well planned timing mishaps have my travel companion end up on the next public bus out of sheer panic, while I wave goodbye to her and shrug my shoulders from my seat at the internet cafe where I've just booked myself into a hostel on Perissa Beach. I can only imagine the next hours of her life trying to find an appropriate place to stay in town amongst the hoards of tourists that just arrived. A sense of calm & relief come over me as I order a greek coffee and sit under the restaurant awning at the port waiting for the shuttle from Hostel Anny Studios to pick me up in the next wave of ferry arrivals — effectively negating any time saved by taking the high speed ferry — but hey, I'm on holiday and I don't really care. As it turns out Perissa, tucked away on the south east corner of Santorini, is a beach haven for couples and travelling sun worshippers. Famous for black sand beaches, the walkway along the beach is lined with bars, pay beaches (yes you have to pay or buy drinks), beachwear shops, and touristy restaurants. While it doesn't have the postcard Santorini feel, it is totally relaxing, and at this point free from massive crowds — not a bad way to wind down after an action packed adventure in Athens. After a couple days of zipping around on the moped, it becomes clear to me that this is the place to stay. 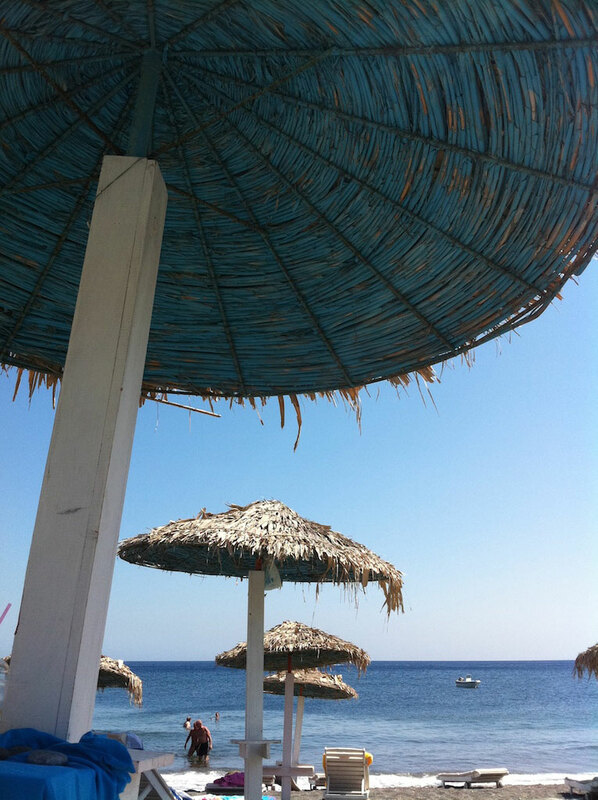 While Oia ('ee-a') and Fira (Thira for anglos) are the hotbed of luxury, shops, and dining, Perissa offers up tranquil relaxation, beachside bars, and fruity drinks with umbrellas in them. 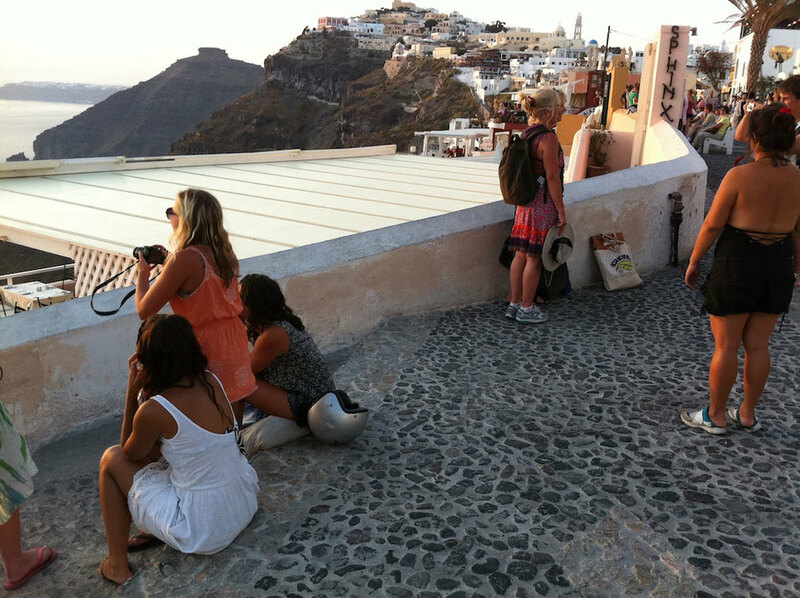 It's only about one hour by moped to Oia for the amazing sunsets and thirty minutes to Fira for sunsets and nightlife. If, however, scootering around an island with tight, twisty, pothole ridden roads is not your thing, perhaps stay a little closer to one of the main towns. The sun has more or less set beyond the horizon now, and the cool air is a refreshing reminder that fall is about to be upon us. My crappy moped sputters along the highway as I recall my past four days on this little island with days spent scootering between wineries, tasting the various and mostly terrible greek wines grown from vines that are shrub like ground dwellers, and wandering the twisty stair filled walkways of Fira in the hot sun. My evenings mostly consisted of romantic sunsets alone, and nights spent poolside at the Anny Studios bar chatting with the American bartender Steven about his years on the island, expanding waistlines, and the good old days back in San Francisco. After a few refreshingly cheap beers I'd wander off with some of the other guests to the twenty four hour bakery down a dusty nearby side street for some freshly baked Moussaka Pie and Baklava, which was more or less the guarantee of a deliciously satisfying case of 2 a.m. heartburn. 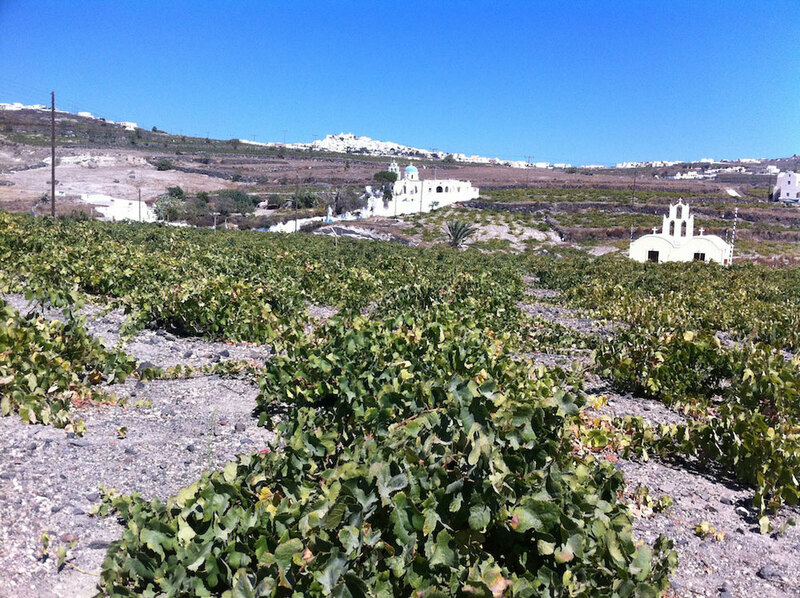 The food on Santorini ranges from totally mediocre tourist fare to ethereal, and everything in between. I had one of the best bruschettas I have ever eaten looking over the sea onto the famous caldera in the perfect afternoon sun. The wine despite its average reputation is not that bad. In fact there were a couple of wines that are absolutely excellent. Even my Gyro experience on Santorini was incredible — I would possibly return just to bite into one of those pork succulent pita delights. 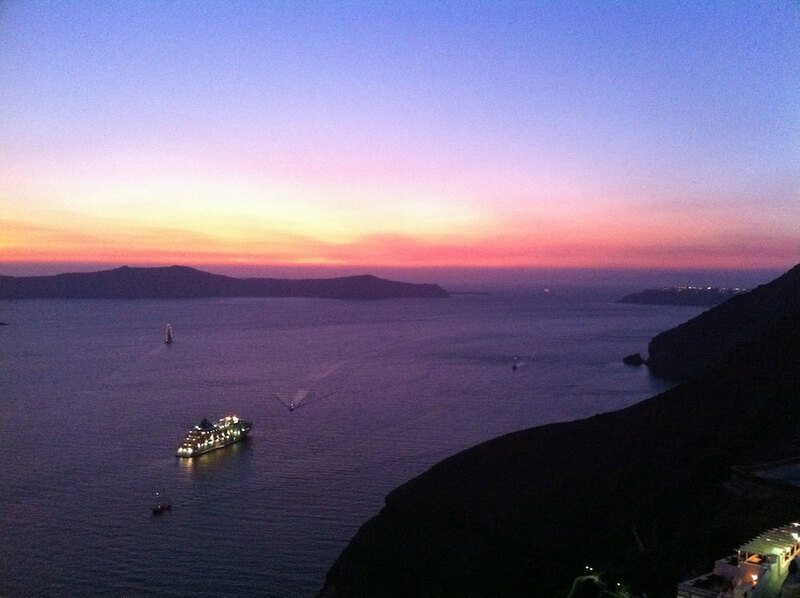 While Santorini is generally horribly tourist ridden, the locals are a hospitable bunch, the food is excellent for the most part, and the sunsets are astonishing. 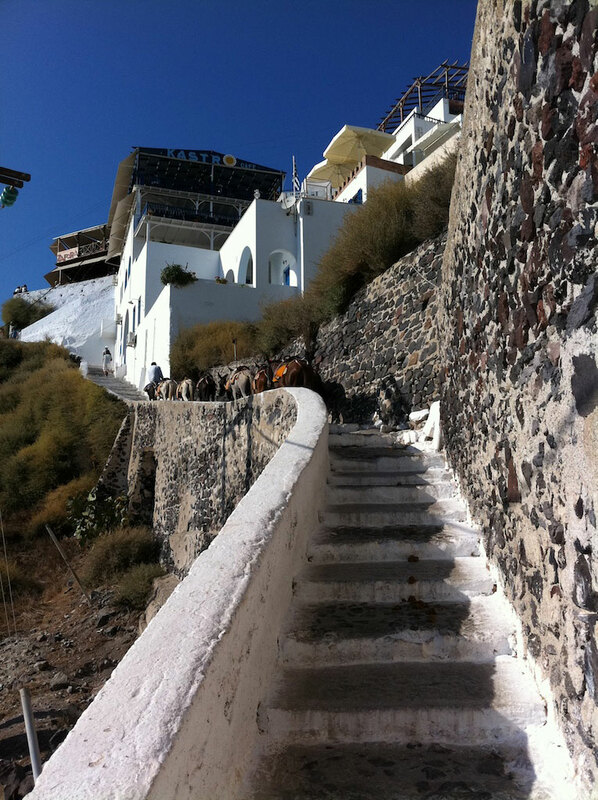 Compared to the hustle and chaos of Athens, Santorini is a nice respite from the urban. 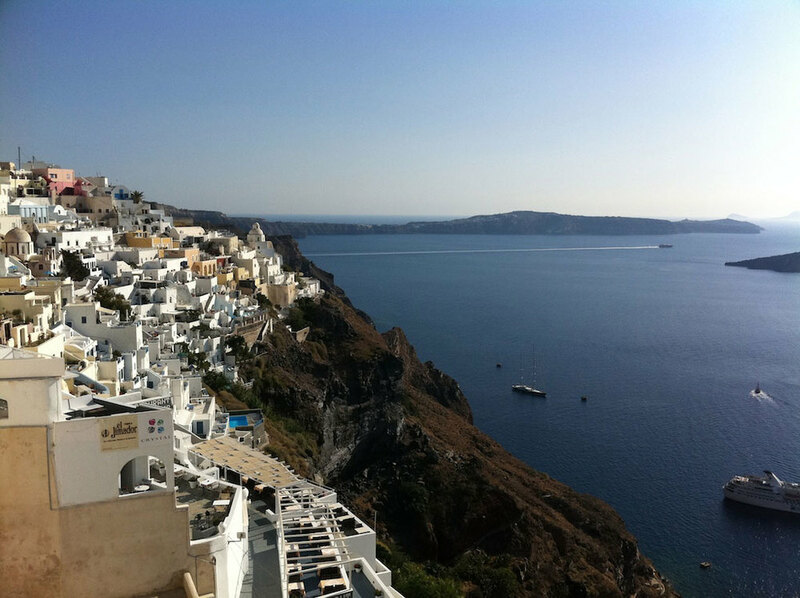 From the beaches, to the wineries and the market shops, to the blue roofs of Oia, Santorini is a stunning little paradise tucked away from the rest of the world. There is really no choice but to relax and enjoy here. 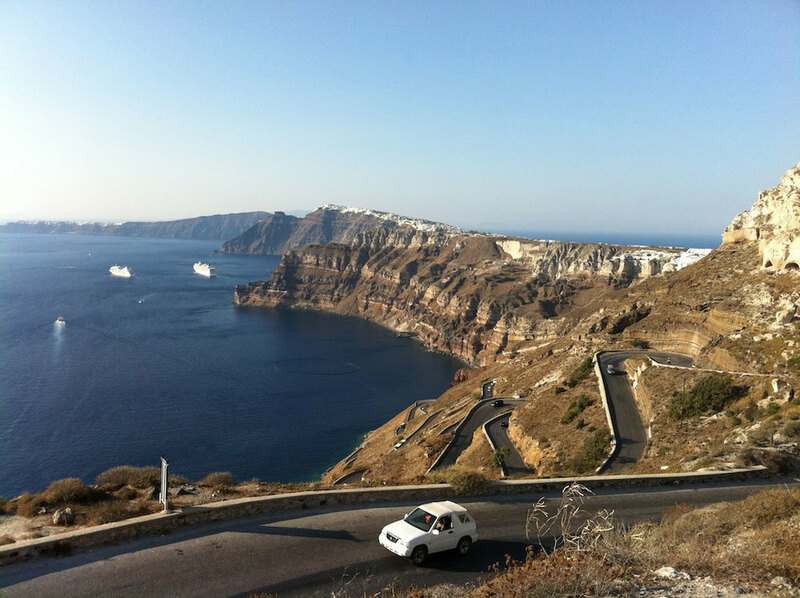 I suppose the reason that Santorini is such a popular destination is somewhat hard to define. There is a somewhat magical quality about this place being far removed from reality. 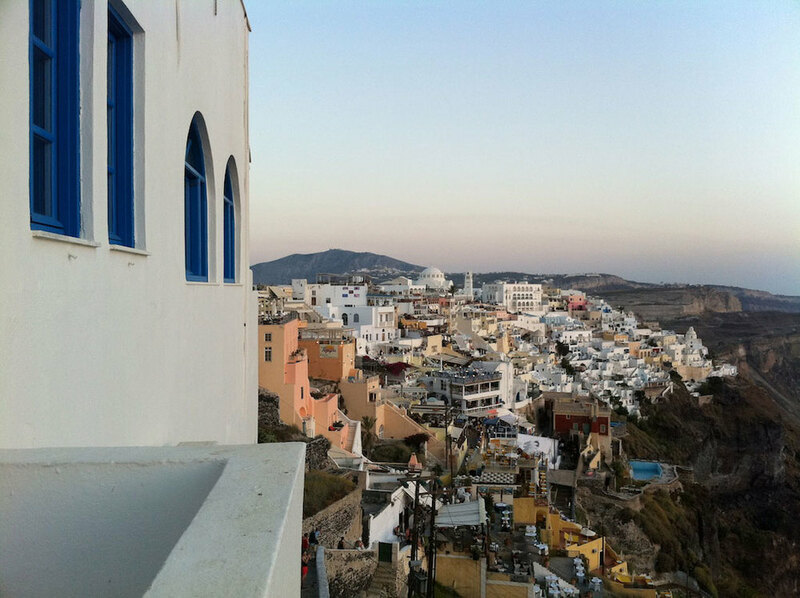 Stopping quickly in Fira for one last look out over the twinkling lights of the town and the dying light of sunset, the warm evening breeze is a comfortable reminder of how far from home I am, and how trapped I am in this little moment on the other side of the world. For me this feeling is the best kind of solitary confinement. I hop back on The Typhoon and putter my way back to Perissa through the darkness, the last remains of sunset in my plastic rearview. I twist the throttle towards me and my thoughts are lost in a swarm of bees. Making a sharp last minute left I opt for one last Moussaka pie before my departure in the morning. The mix of pastry and spiced ground lamb should provide heartburn enough to keep me up for sunrise.